VWO On-page Surveys helps you to collect feedback directly from your website visitors. Using this tool, you can ask specific questions to draw out feedback from visitors. This feedback can help you discover their intentions, motivations, and apprehensions on your website. To learn more about On-page Surveys, click here. To start a survey, click Surveys under Analyze on the navigation bar. Next, in the right upper corner of the On-page Surveys dashboard, click Create. To set up the survey, you can start by entering a title for the survey by clicking on the pencil icon against New Campaign. Then, enter URLs of the pages and define visitor segments. Specify the URLs on which you want to run the survey. You can use URL patterns and regular expressions to run the survey. Visitors landing on these URLs will see the pop-up survey, based on the condition defined by you. PRO-TIP Click the Advanced tab next to the URL field to include or exclude URLs from the survey. Using this tab, you can also define advanced pattern-matching options to include either a broad URL with wildcard entries or a specific URL. To learn more about URL options, click here. Select the Show this survey to a specific visitor group option to target the survey for specific visitor segments. Targeting surveys for specific visitor groups allows you to analyze the survey reports, based on the visitor segments you have defined. To know how to create segments, click here. To define triggers, navigate to the next screen by clicking Next. 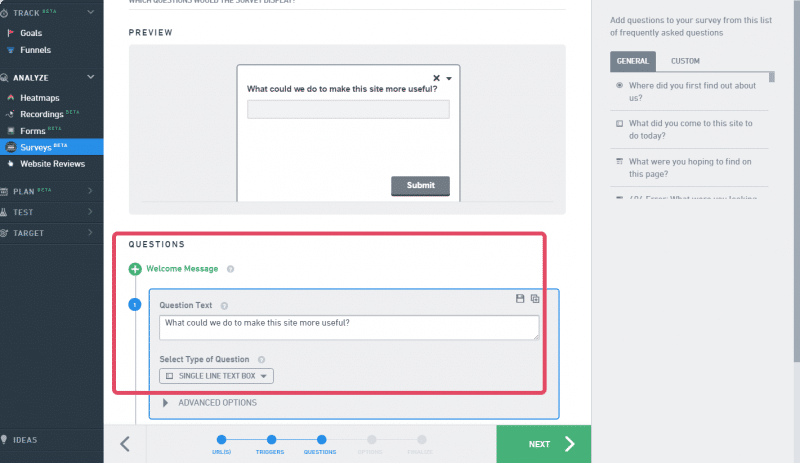 On-page Surveys allows you to define triggers for the surveys to pop up. So you get to specify when should a survey appear on a page. You can select from the list of most commonly used triggers for the survey. By default, a list of commonly used triggers is displayed with limited but most common options selected. 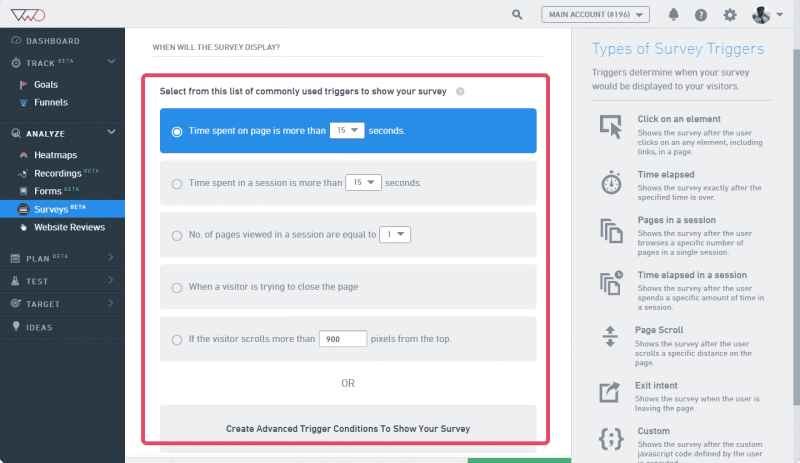 If you want more control over the trigger conditions and/or want to set up multiple trigger conditions, click Create Advanced Trigger Conditions To Show Your Survey at the bottom of the page. To learn more on what trigger to select, click here. The next step in the process is to define the questions you want to be asked as part of the survey. The Add Questions screen is highly customizable, providing you options on what type of questions you may want to ask (single-line, drop-down, radio, and so on), how you want to display the questions, and so on. A survey preview is generated in accordance with the question you type and the theme you select. To learn more on adding questions to a survey, click here. In the Additional Options section, you can specify the theme for the survey pop-up box, custom branding option, and the position of the visitor’s screen where you want the survey pop-up to appear. Select a position for the survey to appear on the screen. By default, a survey appears on the bottom right of the page. You can change the position of the survey to display it on the right or left side of the visitor screen. Select a theme for the survey pop-up. You get a number of themes for you to choose from. Select any one to get a preview on the top of the screen. You can also create your own custom theme. Select New Theme from the list to create your custom theme. When you click New Theme, the CSS of the Dark theme is loaded in two code boxes where you can customize the theme. If you want to load a different theme for customization, select the theme to load using the Base theme drop-down list. The specific CSS will load—one for the CSS of the survey container and the other for the CSS of the content in the survey container. You can make changes to the CSS and then save the theme with a different name. When a new theme is saved, the theme name will appear in the Theme drop-down list. You can then select it for creating any other survey. You can set your preferred language for the survey to translate translate system messages and field validation errors. For example, you can translate field error validation messages like ‘A response is required’ in another language to make it relevant for your website visitors. You can remove VWO branding and optionally add your own branding by uploading your logo. 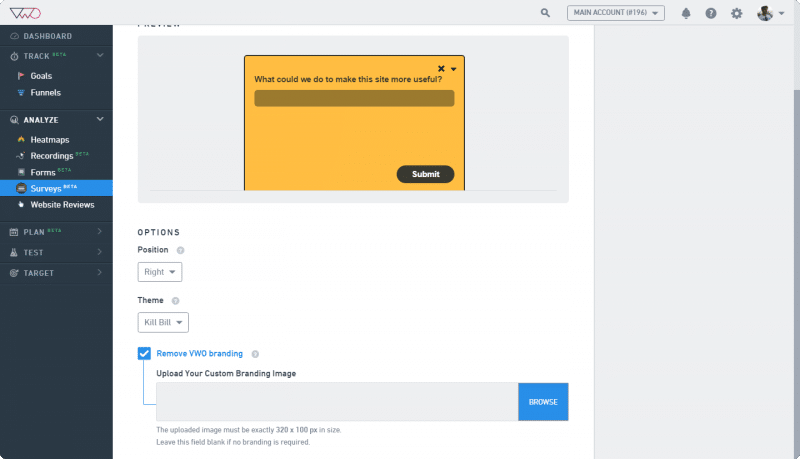 Select this option if you want to remove VWO branding in the survey. If you are loading your own logo, ensure that its dimensions are exactly 320 x 100 px. Any deviation from this will cause the logo to appear distorted. On the finalize screen, you can name the survey, specify the traffic percentage, and define other additional settings. Type a survey name to easily identify your Survey. To add notes and labels to the survey, click Add Notes and click Add Labels. Adding notes and labels helps filter survey easily. 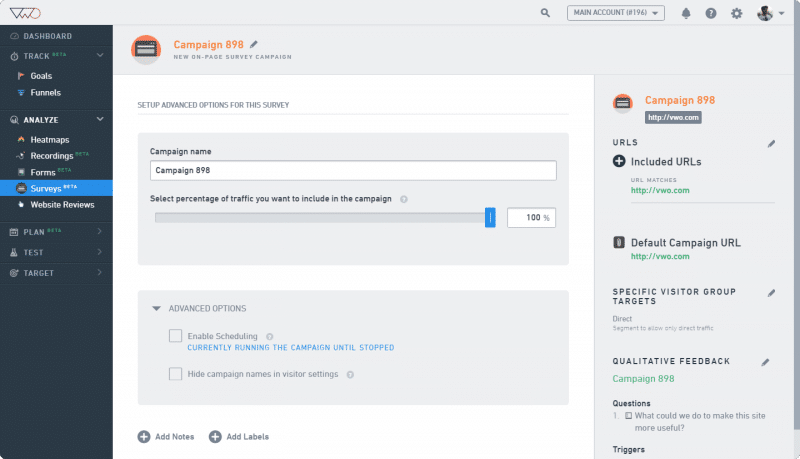 To increase or decrease the traffic percentage, accordingly move the Select percentage of traffic you want to include in the campaign slider, or manually enter the percentage in the text box. Select Enable Scheduling to automatically start or pause a survey at a certain time and date or after exceeding a certain number of visitors. Click here to know more about scheduling a survey. Enable Hide campaign name in visitor settings to replace your test or variation information with a standard content format when visitors try to view the information using the “view page source” option in their browsers. For example, if you have a survey named “Survey for pricing page,” VWO will replace it as survey-numerical ID (such as survey123456). If this option is enabled, website visitors cannot view your important details (such as survey name, variations name, and so on). ATTENTION You cannot enable this option for running survey(s) which are paused or stopped. To create the Survey, click Finish. Congratulations! You’ve successfully created your On-page Survey. How does quota consumption work for surveys? Is the Welcome screen always displayed? Does VWO Surveys work on secure https webpages? What does the survey preview show? Can I have a different theme for my survey? Can I test a survey on my website before making it live? Can I test a survey locally on localhost? Can I trigger a survey when a visitor converts for an existing goal in VWO? Can I trigger a survey once a visitor scrolls down a page? 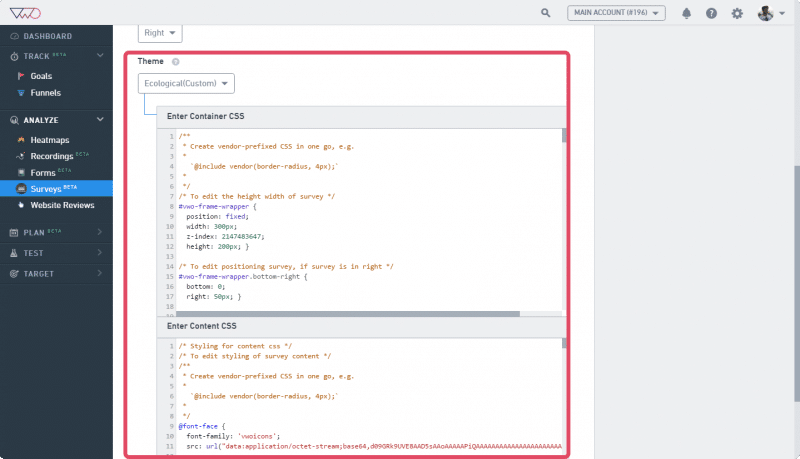 Do I need to add a separate tracking code for VWO Surveys?